There are those who disparage mouse guns. These are the little guns, the vest pocket guns, that are easily concealed, light weight, and chambered for small cartridges. They’re second guns, or hide-out guns. Some who disparage mouse guns say the cartridges they shoot are too weak for self-defense. Others say that they’re not accurate and complain about the sights, the grips, and everything in between. Of course, they have a point. But, I still like mouse guns. They’re little jewels of technology. Their makers have had to figure out how to make something that would work, stand up against recoil, and still be small enough to carry in pocket or purse. I don’t have much interest in today’s mouse guns; the Ravens, Lorcins, and Jennings. Not my cup of tea. I like the old ones, the ones like our ancestors bought and carried. These guns are made of steel, not pot metal. They have heft and some serious machining. Webley had already started production of a small gun. One of their designers met with H&R’s engineers and they worked out a plan. Webley would license the design for a fee and H&R would sell it in the United States and make it in their own plants. This got around steep tariffs. Certain realities caused the designer to make changes from the British model. They got rid of the hammer using a striker design instead. After all Colt's successful vest pocket gun had no hammer. They had to re-engineer the sear and trigger links because it was a smidgen too close to Colt’s patents. 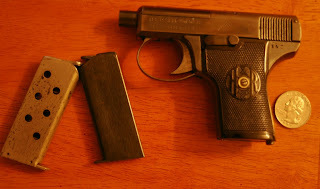 In 1912, both companies launched versions of the pistol, one in Great Britain the other in the United States. One thing I like about the naming of the gun. H&R purposedly avoided the use of "semi-auto" suggesting that it could be too easily confused with fully auto. Had everyone at the time avoided that term, we may not have had the confusion between self-loading and automatic weapons the anti-gunnies have exploited. The guns were not necessarily commercial successes. The Webley model was plagued with jams, but the H&R model proved a little more reliable. H&R stopped production in late 1916 and made a total of 16,630 pistols. My gun is the H&R model. It was made in early to mid-1916 judging by the rollmarks and the serial number (which I obscured in the photo). It remains popular as a collector’s item because it was an early semi-auto mouse gun and it was well made. The gun is solidly built with master-level machining throughout. It is also an early example of a gun that will give a no-snag draw from one’s pocket. Look at the rounded contours, the lack of a hammer, etc. I haven’t shot this gun yet, although some day I will. However, I doubt I’ll hit anything with it. Remember I mentioned some people criticize mouse guns’ sights and that this gun would never snag in a draw. Well, this little gun has no sights at all, not even a groove cut into the top of the gun. It’s the ultimate belly gun. I actually came across one with the serial number of 1637x. I have never seen one this high. It is in 99.9% finish and gorgeous.